Buena Park offers visitors and locals some of SoCal’s most popular attractions. In addition, you are close many Los Angeles landmarks and award-winning beaches. Each year, Buena Park welcomes millions of visitors to bask in the warm eather climate. Plus, the city has been named one of the “Most Fun” Small Towns in America! We definitely agree with that statement. With the changing seasons, Buena Park welcomes both new and exciting events all around this great town. There is definitely always something in season at Knott’s Berry Farm all throughout the year. In addition, put on your Halloween costumes in the fall and see the snow fall later in the year. It’s non-stop family fun and warm temps in the California sun. Therefore, enjoy annual festivals, dinosaur digs, seasonal waterpark and much more. Plus you will want to mark your calendars. There’s lots to see and do so bes ure to keep up with all the happenings in Buena Park. If you want to make Buena Park, California a travel destination for the this year, you are in luck. We’d like to share the city’s Annual Calendar of Events with our loyal readers. Everything comes to life in spring with the kick off of the Knott’s Berry Farm Boysenberry Festival in mid-March. Through early April, you can enjoy over 50 boysenberry dishes, live entertainment and interactive experiences with Buena Park’s favorite berry as the star. Celebrate the sun in California style with the opening of Knott’s Soak City waterpark in late May. Take the seven-story plunge down Shore Break or float in the longest waterpark lazy river. Open through early September, Soak City is the perfect spot to cool off in Southern California. Family Fossil Days comes to the Interpretive Center at Ralph B. Clark Regional Park on the first Saturday of May. Bring all of your dinosaur questions to ask the archaeologists during the free three-hour tour and fossil hunt. 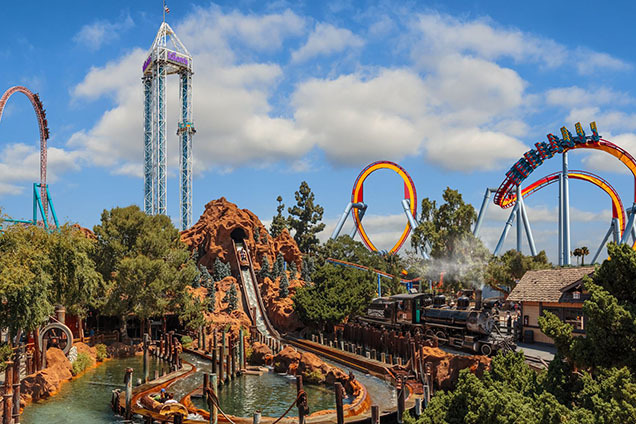 Summer is all about getting out and enjoying the California sunshine, starting with a trip to Knott’s Berry Farm. From June through August, the citizens of Calico come to life and you can become one of them at Ghost Time Alive. Help the sheriff stop some bank robbers, play cards at the saloon and kick up your heels at the evening hoedown. On Wednesday nights at 7 p.m., music takes over Buena Park with performances by your favorite local artists and cover bands. In June you can find the live performances at Boisseranc Park and in July and August the shows move to the Buena Park Downtown Mall. Plan to spend our nation’s birthday at Knott’s Berry Farm where the festive revelry includes a Fourth of July Fireworks Show and live entertainment. When the trees start turning all shades of orange we know that means Halloween is right around the corner. Knott’s Scary Farm comes to life in mid-September with every form of monster taking over the park for the world’s largest Halloween event. Dozens of mazes, scare zones and live shows that could raise the dead are just some of the fun that lasts through the end of October. If you are looking for more treats than tricks, head to Knott’s on the weekends in October where Knott’s Spooky Farm brings family-friendly trick-or-treating, fun-filled shows and costume contests. Buena Park’s Most Interactive Show – Pirate’s Dinner Adventure takes on its own Halloween twist with ‘Vampirates’ throughout October. The two-hour show includes a three-course feast with an added costume contest. Festivals fill the fall months with the Olde Tyme Fall Festival kicking off the celebrations in the Buena Park Historic District. The whole family can join in the fun with haunted tours, Halloween crafts, local food booths and live musical performances. Mark your calendars for the third weekend in October when the Silverado Days Festival takes over William Peak Park. Enjoy carnival rides, games, food and costume contests. October also brings another opportunity to don your costume at Rock & Brews Annual Monster Beer Fest. There, you can enjoy over 100 craft beer samples, live concerts, food and more. If you haven’t had a chance to attend Family Fossil Days earlier in the year, plan to head to the Interpretive Center at Ralph B. Clark Regional Park. It is held on the first Saturday in September. This free three-hour tour of prehistoric Orange County, culminates in a fossil hunt at a real dig site. While the Buena Park weather may only barely show the coming of winter, the activity around town takes on a festive vibe during the last months of the year. Buena Park takes the opportunity to say “Thanks!” to military personnel during the months of November and December. There are hotel, attraction and dining deals, and free admission to Knott’s Berry Farm. Fire and police personnel also receive the royal treatment on select days in December and January. They along with a guest get in free to Knott’s Berry Farm. In late November, look for the winter wonderland of Knott’s Merry Farm to come to life. Get in a festive mood with nightly snowfall, live shows and holiday food through early January. Step back in time as archaeologists lead a free three-hour tour of prehistoric Orange County culminating in a fossil hunt at a real dig site. Mark your calendars for the first Saturday of December and February. This insightful event is held at the Interpretive Center in Ralph B. Clark Regional Park. Ring in the New Year as only Knott’s Berry Farm knows how to do it with exclusive entertainment, specialty food and a midnight fireworks spectacular. Then continue the celebration into January and February with the Peanuts Celebration. Knott’s will offer Peanuts-themed shows, rides, food and interactive experiences with your favorite characters including Snoopy, Charlie Brown, Lucy and Pig Pen. To extend your trip, be sure to endulge in a VIP experience. We offer a wide variety of VIP access to red carpet events, Hollywood movie premiers and fashion shows. In addition, we can even arrange a “meet and greet” with your favorite Hollywood celebrity. The possibilities are endless. Are you ready to plan your trip to Buena Park, California? Contact us today and our travel specialists can help you plan your luxury vacation. Be sure to come back and visit this luxury blog. We love to share the best news in the lxuury industry. ← Macy’s Flower Show 2018 in New York City – Spring is Here!